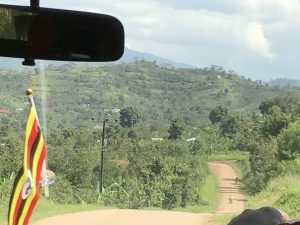 In a recent trip to Uganda (October, 2017), Hugh Burgess and John Taylor visited Kagando Hospital where Jamie’s Fund is supporting an initiative that is taking mental health care into the community. Here they outline the approach Kagando is taking. 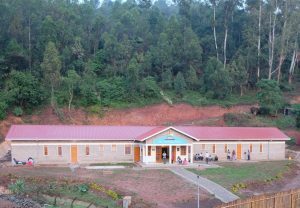 Kagando is a busy Church of Uganda hospital, not far from the border with the Democratic Republic of Congo, and it provides a wide range of health services to the local community. 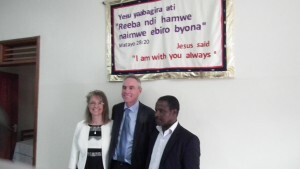 We were impressed with the work being done there and especially with the very busy maternity ward. 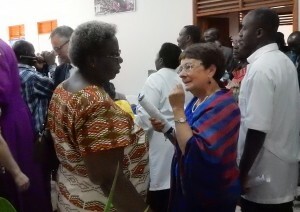 It was a big surprise to meet inpatients being treated for leprosy, a disease I thought had disappeared. 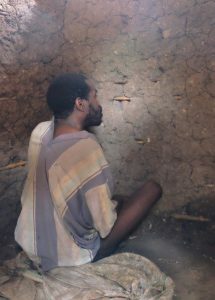 Kagando is fortunate to have two trained psychiatric nurses. They have mainly been working in general medicine but with funding from Jamie’s Fund, they are being released for part of the week to go out into the community. Jamie’s Fund has also provided funds for a motorcycle to facilitate this. The model they are using is to send out a message to a local community to invite those with mental health needs to meet the mental health team at a given place and day. Patients’ conditions are then diagnosed and a course of treatment planned. This is then delivered by the nurses travelling to patients’ homes or local villages on a regular basis. Travelling to a clinic along “murram” roads. The advantage of this approach is that it helps patients who are very poor or distant from the hospital to get treatment that might otherwise be unavailable to them. We felt privileged to attend some of these clinics and to see the plan in action. 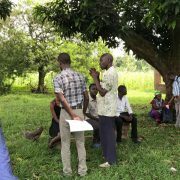 Here the clinic is being held under a mango tree on the edge of a village. 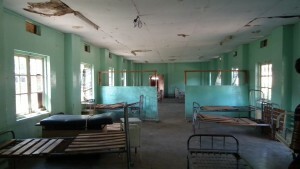 Five patients were diagnosed here. 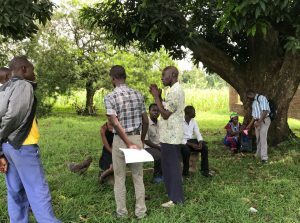 A clinic under a mango tree. Follow-up treatment was arranged for a few days later. 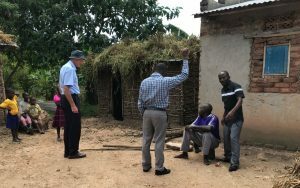 We were hugely impressed by the compassionate and professional care that was shown by the Kagando team and are delighted by the progress that is already being made in finding some of those who most need treatment and care. This is being delivered in the community, which not only reduces that difficulty faced by patients in getting to hospital but also eliminates the costs of hospital care that can often deter patients and their families seeking care in the first place. 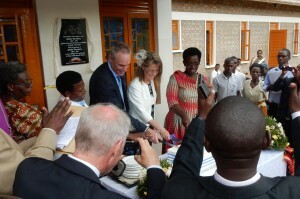 Hugh’s account of the Grand Opening of the new Ahumuza centre! 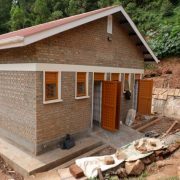 Over the last few years a lot of people have very generously donated to Jamie’s Fund and so, by the beginning of 2016, we were in a position to begin building a new mental health unit at Kisiizi Hospital. A British architect designed a very swish building but after lengthy discussions about the costs and the location of the unit, the design was simplified. Building eventually began in the middle of 2016. It was quickly discovered that the chosen site was very wet and so a redesign was needed and two “ground beams” constructed to keep the building rigid. Bricks were sourced locally and the building went up quickly. Fitting out took rather longer and so it was only in April 2017 that the building was eventually handed over to the hospital by the building contractor. 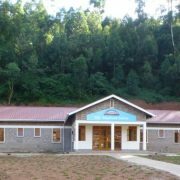 I visited Kisiizi in November 2016 when much of the work had been completed but the building was still empty. It was wonderful to see it but it was still only a shell until it had people in it and using it. … and the old ward today – where so much extraordinary work has been done over the years with so little! 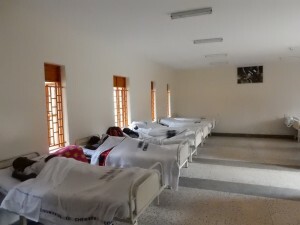 Following the hand-over, patients were moved from the old, dilapidated ward to the new Centre. 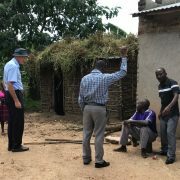 In May this year I visited the old building (a single ward housing men, women and children plus the relatives who were caring for them) and it was in a very poor state of repair which is hardly surprising after more than 70 years of use. 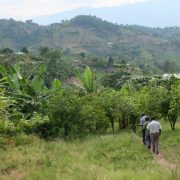 This year, seven of us, including Jamie’s parents, Jim and Avril, travelled to Kisiizi where we arrived on Thursday, 18th May. 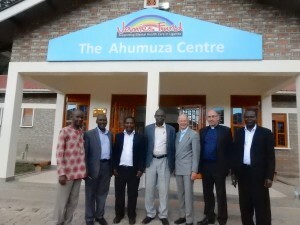 After being welcomed by old friends from the hospital, we were taken to see the new Ahumuza Centre. 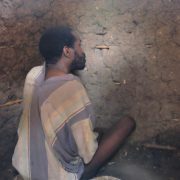 Ahumuza means “Comfort” or “He comforts” in Rukiga. It was a much more emotional experience than I imagined and more than a few tears were shed. ine, in his place. Incidentally, Dr Diana is also the personal physician to the President of Uganda. The 19th of May was a beautiful day and there was great excitement as final preparations were made. The concrete path to the Generator House and the new fences that screened the “long drops” and kitchens of the maternity ward had been finished. There were final touches and the sweeping and tidying away of unwanted materials so that by 10 o’clock, when the visitors began to gather at the primary school next to the hospital, all was ready. 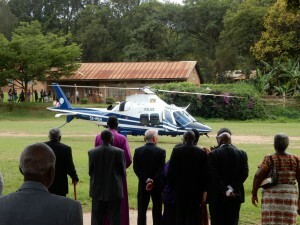 As is the way of these things Dr Diana didn’t appear until about 1pm but there was great excitement, particularly among the children, as she came by police helicopter from Kampala and landed on the school playing field in a great cloud of dust. 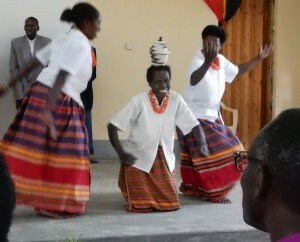 There were magnificent Rukiga dancers to meet her and the large crowds already there grew during the day. 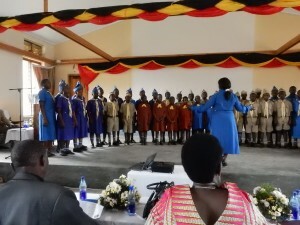 The first order of the day was the official opening and so a great party of people, important visitors, politicians, clergy, police, doctors, nurses, patients and a host of others wandered up to the Ahumuza Centre where there prayers and a blessing were offered followed by a short hymn. 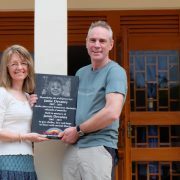 The plaques were unveiled and then Dr Diana invited Avril and Jim to join her in cutting the ribbon, as she declared the Centre open. The crowds continued to mill about and the VIPs and others were then given a guided tour by a very proud Sister Nancy. A large cake was then presented and cut by Dr Diana and Avril and Jim, with portions being given to VIPs, patients, staff and no doubt to many of the people who’d simply turned up to see what was going on! 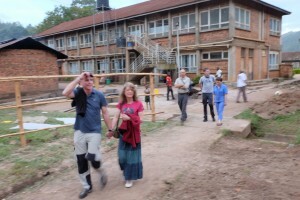 The tour of the Ahumuza Centre was followed by a brief tour of other areas of the hospital with a long crocodile of people involved before everyone gathered in the school hall where we were welcomed by the Chair of the Hospital (I think) who introduced many of the individuals and organisations represented. 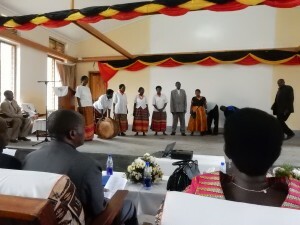 There was some wonderful Rukiga dancing and very moving play and dance put on by the staff and patients of the Mental Health Centre. 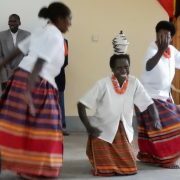 As this group danced a very energetic Rukiga dance, they were very movingly joined by Dr Sheila Ndyanabangi, Head of Mental Health Services in the Ministry of Health in an impromptu show of support for those with mental health issues. There were speeches by a number of people. 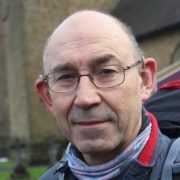 Dr Lionel Mills, a GP in the UK, spoke movingly of the start mental health services at Kisiizi in the 1990s. 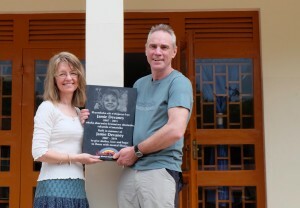 Dr Diana Atwiine thanks Jim and Avril and all those who have given so generously through Jamie’s Fund. 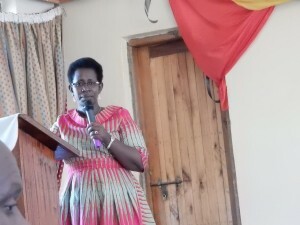 Dr Sheila spoke about the importance of mental health services and the particular place that Kisiizi had in her heart. 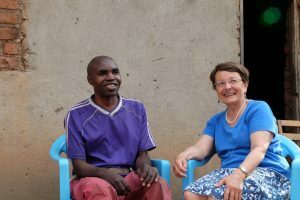 I spoke about Jamie: how he came into my life, that he was a very special little boy and that although he is no longer with us, his untimely death has encouraged many others and leaves an immense legacy not least in the Ahumuza Centre. 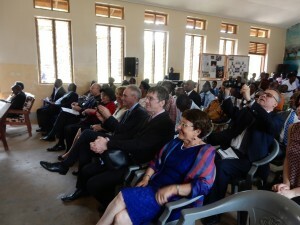 I also cautioned that there is much more to be done in Community Mental Health work as well as in the hospital itself. Bishop Patrick Tugume (retired Diocesan Bishop) then spoke very movingly and personally about Jamie and the gift that he was, a theme that was then picked up by Dr Diana who was very moved (and moving) about the work done by Kisiizi Hospital, and particularly for patients with mental health needs. The day was rounded off by the National Anthem and a delicious meal prepared overnight by members of the Hospital team. 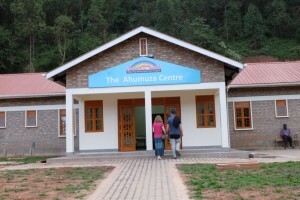 It was a wonderful day and, for me, it was particularly exciting to see the Ahamuza Centre “open for business” and to see Sister Nancy beaming from ear to ear!! I would like to thank everyone who have contributed to the building of the new Ahumuza Centre, however much or however little because, as we have always said, every penny counts towards improving mental health care in Uganda. Thank you! Members of the Patients’ Group prepare to dance! http://jamiesfund.org.uk/wp-content/uploads/2017/09/DSCF3760-2.jpg 887 1280 EdwardLamb http://jf2016.dupecreative.com/wp-content/uploads/2017/08/jf-logo-2017.png EdwardLamb2017-05-28 10:29:422017-10-19 15:58:25Hugh’s account of the Grand Opening of the new Ahumuza centre!